BYB 300 Lumen Collapsible Lantern Review – What a Nice Light! I was sent this BYB 300 Lumen Collapsible Lantern a while back for review and I can start by saying that, for the price, I was very impressed. In fact, this light *may* end up being my go-to battery-powered camping and emergency light from hereon out. Although I’ve long been a fan of the Rayovac Sportman lantern for it’s longevity and relative brightness, this BYB lantern has several distinct advantages over the Rayovac, but I’m getting ahead of myself. I should point out that this feature is about the ONLY thing I’d prefer to see different in this lantern. That is, the fact that there is NO option for a low power setting to both reduce light emitted but also to conserve battery power. In other words, the light seems to use as much battery power whether it’s cracked or all the way extended. The manufacturer’s description does state that it has “low power conservation”, whatever that means, but I would have preferred the option to dim the lantern myself. How does the light stack up against the others? What are the advantages of the BYB Lantern? For starters, it’s relatively lightweight. It weighs about as much as the little kid-friendly lanterns but significantly less than the Rayovac (especially when the batteries are inserted). Which reminds me, the BYB lanterns runs off only 3 AA-batteries, a huge plus when it comes to having to scrounge for batteries to keep it running. 😉 The Rayovac, on the other hand, uses D-cells which can be a pain to stock and/or find in a pinch. I submerged it in my sink for a good hour to test that claim and, yes, the lantern still worked just fine after pulling it out. However, the globe was half-filled with water so I won’t say that it’s watertight but it’s certainly good enough to not worry about the lantern functioning out in the rain or if it takes an unexpected dip in the lake. I was going to take a picture of the globe half-filled with water but by the time I’d thought to go grab the camera the water had mostly drained out and so I didn’t bother. Anyway, after the water drained I popped the batteries back in and the lantern worked great. I did notice, however, that condensation remained inside the lantern that refused to go away so I had to remove that with some air and heat. No big deal. Also, being that it collapses in on itself there’s no worry about the globe breaking. I was slightly hesitant that, because it simply slid open to turn on, one *might* inadvertently turn on the lantern if jostled but after playing with it for a while I’d say it’s no more likely (perhaps less so) than accidentally pressing a button or flipping a switch on any of my other lanterns. Besides, a rubber-band or two around the handles would help to keep it from opening… and I could just take the batteries out while in transit. That’s about the only question I’ve yet to fully answer. I couldn’t find anything online about battery life so I ran the lantern 24 hours straight on a set of batteries that I doubt were fully charged and it was still going strong. That’s good news because it seems I could easily run this for a week on a set of batteries if I ran it for 4 or 5 hours a night. So, we’ve covered that it’s relatively compact (a bit larger than a can of beans), fairly lightweight (among the lighter options), uses AA batteries (which are easy to scrounge), is quite bright (the brightest lantern, in fact), runs for a long time on one set of batteries (I still don’t know quite how long)… did I mention it’s affordable? 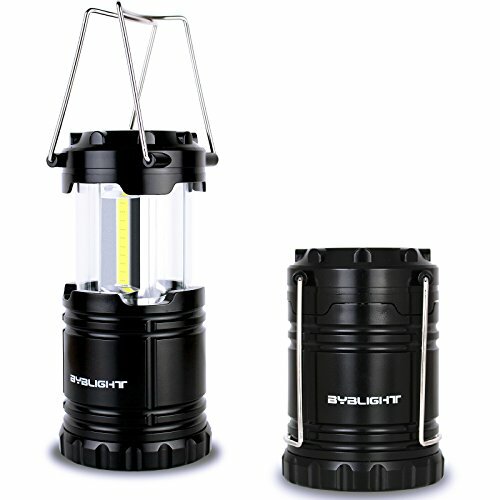 At a current price of $14, the BYB Lantern is nearly half the cost of the Rayovac Sportsman. That’s hard to beat.